I was bringing in the washing yesterday evening. It was chilly and felt almost like there could be a frost. A bee was clinging to a towel well after most bees would have returned to their hives. She had been caught out by a sudden change in temperature and had become too cold to go any further. It is something that you will see more frequently in the coming days with the unsettled weather. Or, she could have just been old. You can recognise an old bee by the shininess of her body. Bees only live for about six weeks in the season but change as the weather grows colder. In winter, they are physiologically fatter and designed to live a lot longer. 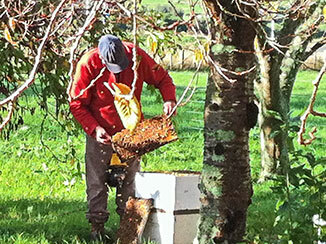 As the days grow shorter and the temperature drops the foraging hours for the bees are reduced. The queen slows her laying right down and there is a lot less work. Hive numbers shrink and fewer bees venture out. This is when they start to consume the honey that they have been stockpiling all summer. The last of the drones are gone, turfed out in front of the hive. The bees cluster in the hive, keeping each other and, most importantly the queen, warm. Some of them on the outside of the cluster will die if it gets very cold. These bees drop to the bottom board of the hive and will be cleaned out once the weather starts to warm up again in spring. A warm, dry, winter day is good for bees. They make cleansing flights which are basically toilet flights. Bees prefer to defecate as far from the hive as possible so a good day will see the majority of bees heading out. When food is short, there is a real danger of bees robbing off any honey they find around. They will find any scraps of honey in old discarded honey jars, wax scrapings from cleaning frames or discarded hives. This is increases the risk of transfer of disease, particularlyamerican Foul Brood back into your hives. Commercial beekeepers are sending their honey off to the packers for local consumption and export. Hobbyists are spreading the rich wonderful harvest from their bees around to their friends, family and local markets. Correction to last month’s information re the Otaki Buzz Club. Sarah Bayliss is the chairperson 06 364 0555.